Galatoire's Bistro is having a wine dinner featuring Gary Farrell wines on Friday, April 30th, at 7:30 p.m. The dinner is $75 per person (inclusive of tax & gratuity). Juban's will be host to the Robert Mondavi Six-Course Harvest Dinner on November 4, 2009, honoring the life of Robert Mondavi. On Tuesday, September 22nd, Jan Shrem, founder and proprietor of Clos Pegase Winery,will be Juban's special guest and take you on a visual art journey titled �A Bacchanalian History of Wine Seen Through 4,000 Years of Art.� A 5-course wine dinner will complement Mr. Shrem's presentation. Galatoire's Bistro cordially invites you to attend the upcoming Mumm Champagne Dinner on Wednesday, June 17, 2009, at 7:00 pm. Throughout the evening, unique menu creations from Chef de Cuisine Nathan Gresham will be perfectly paired to complement a variety of Mumm Champagnes. The dinner is $85 per person including tax and gratuity. The event will feature five gourmet courses paired with the wines of Oregon's Bergstrom Winery. General Manager and Wine Maker Josh Bergstrom. Galatoire's Bistro cordially invites you to attend the upcoming Chappellet wine dinner on Wednesday, April 22, 2009, at 7:00 p.m. The dinner will feature unique menu creations specially designed by Executive Chef Brian Landry to complement a variety of Chappellet wines. Reserve your seat today--$85 per person including tax and gratuity. Galatoire's Bistro and Habitat for Humanity of Greater Baton Rouge cordially invite you to attend the upcoming Chateau St. Jean wine dinner and silent auction on Wednesday, March 25, 2009 at 7:00 p.m. The dinner will feature unique menu creations specially designed by Executive Chef Brian Landry to complement a variety of Chateau St. Jean wines. Silent auction items will include spa treatments, local artwork, jewelry, and much more. Proceeds from the dinner and auction will benefit Habitat for Humanity of Greater Baton Rouge in their quest to help families in the Baton Rouge area. Juban's Restaurant is partnering with Susie Selby and Selby Winery to present a special Wine Dinner on Wednesday, April 1, 2009, featuring contemporary Creole cuisine paired with some of the winery's blue-chip varietals from Sonoma County. Susie will be flying in from California wine country to discuss with guests the tasting notes of each wine and explain how the distinct flavors complement the innovative combinations of Chef Terry McDonner's dishes. Galatoire's Bistro cordially invites you to attend the upcoming Geyser Peak wine dinner on Wednesday, January 28, 2009 at 7:00 p.m. The dinner will feature unique menu creations specially designed by Executive Chef Brian Landry to complement a variety of Geyser Peak wines. Reserve your seat today, $85 per person including tax and gratuity. 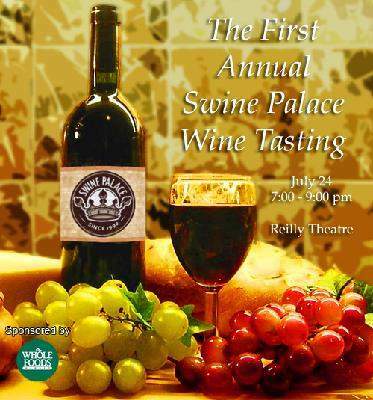 Share a summer night of fine wine and hors d'oeuvres on the Reilly Theatre stage at Swine Palace's first Annual Wine Tasting fundraiser on July 24th. 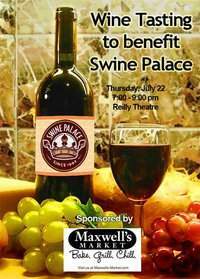 For $35.00, you can sample an assortment of excellent vintages while supporting Louisiana's premier professional theatre. Galatoire's Bistro cordially invites you to attend their French vs. American wine dinner on April 16, 2008 at 7:30 p.m.
You'll sample a variety of French and American varietals and let your own palate decide which is best while enjoying unique menu creations from Chef Brian Landry. Be sure to join us as we compare and contrast French and American varietals. Reserve your seat today: $85 per person including tax and gratuity. A luxury night of wine tasting, jazz and great food. Only the finest wines will be served. Purchase tickets at http://www.localwineevents.com/New-Orleans-Wine/event-173840.html. Hurry, only 250 available. Galatoire's Bistro cordially invites you to attend the Penfolds Wine Dinner on March 26, 2008, at 7:30 p.m. The dinner will feature unique menu creations specially designed by Chef Brian Landry to complement a variety of Penfolds wines. Reserve your seat today: $85 per person including tax and gratuity. Galatoire's Bistro cordially invites you to attend the Oriel Wine Dinner at 7:30 p.m. on February 20, 2008. The dinner will feature a selection of fine Oriel wines perfectly paired with Galatoire's Bistro signature dishes. Reservations are required and space is limited...so sign up today! Announcing the Winter Gathering of Baton Rouge Uncorked, for the Benefit of the Louisiana Art & Science Museum. Food will be provided by Varnedoe's Carriage House Restaurant. $20 minimum donation per person to benefit the charity when registering your team, in addition to your team's 3 bottles of wine for the tasting. Celebrate Your New Year's Eve with Galatoire's Bistro. Join them Monday, December 31st, at 8:00 p.m. for a New Year's Eve Champagne Dinner featuring a selection of Mo�t & Chandon Champagnes. Reserve your seat today, $135.00 per person including tax and gratuity.